COMMUNITY NEWS & REVIEWS: As the Autumn season creeps ever closer to the Winter period, the days are getting shorter, the nights will get darker earlier and the weather forecast no doubt will take a turn for the worse. Our health does not have to follow suit !. The seasons are beautiful in their own right, for any number of reasons - but what is NOT good however, is the misery that often accompanies Winter which is the ‘FLU’! All Medical Centres and Doctors’ Surgeries are urgently asking the members of the public to pop in and have the ‘Flu Jab’. By taking a few minutes to do this, it will not only prevent you from suffering from this miserable virus, but by getting vaccinated, you are helping to protect those around you who may be at risk of serious complications. It’s best to have this jab at the start of the ‘flu season’ - in the Autumn - but it’s still worth getting vaccinated any time before the end of March. Everyone in an “At Risk Group” can have a free flu jab. Please just contact your GP Surgery or local Pharmacy Team for more information or to book an appointment information or to book an appointment. THE RYE DEANERY: APPEAL - The Rye Deanery is a group of 17 parishes and is part of the Church of England structure. It is also an important link between a parish and the Diocese. The parishes send representatives to the Deanery Synod which only meet four times a year but is a very helpful way of sharing ideas and passing on solutions to various problems. So -- what is this Appeal about ? -- Sadly, the present Treasurer is standing down and another ‘Good Samaritan’ is desperately needed to take over this small but vital role. The bookkeeping side is fairly straightforward but the role is important as you will be an essential part of the team which liaises with the Diocese and each parish in the Deanery and part of the effort to fulfil the mission of the church. The current Treasurer (Philip) will be readily available to assist whenever & wherever necessary. If you feel that you can take on this role or might be able to , please contact Philip on 01892 ~652404 or via his email at: philipbowden@btinternet.com Please contact him to discuss this further. STAPLECROSS MCP SCHOOL: News just in.....The school would like to advertise that it’s our schools Harvest Festival Service at St Mark’s Church this Friday 12th October ‘18. We’re having two services, one at 9.30am for Swallows and Robins classes and then one at 2.30pm for Kingfishers and Kestrels. There will be tea/coffee and cakes served in the Church rooms after the 2.30 service from about 3.15pm. All are welcome to join us. ROTHER RAMBLERS: Braving the elements of such diverse weather conditions that Mother Nature sends us are part & parcel of being a member of any outdoor group. The Rother Rambler members are just such a group and enjoying our beautiful countryside in not always super sunshine is a small price to pay for the stunning scenery and free fresh air that accompanies their ‘rambles’. 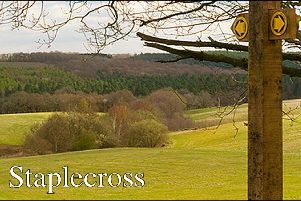 The group have two (2) more walks for us to enjoy this week and Walk No:1 has been arranged for Saturday October 13th and is a 9 mile circular walk around Ashdown Forest. The meeting point is the ‘Kings Standing car park on the B2026. OS.EXP135. TQ473301 (satnav TN22 3JD) at the normal time of 10.00am. The walk notes state “ The car park is on the East side of B2026, just South of B2026 & B2188 junction. A picnic lunch is again suggested. Liz is to be your ‘walk leader’ for this stroll and you may contact her on 01424~846437 for more information. Walk no:2 is planned for Wednesday October 17th. and is an 8.5 circular meander from Marden. The meeting point is the is the car park in the centre of Marden village. OS.EXP136. TQ745445. (satnav TN12 9DR) again at the normal time of 10.00am.The walk notes for this walk state “There is alternative ‘on-road’ parking nearby and a picnic lunch is again a suggestion” Martin will be your ‘walk leader’ for this excursion and you may contact him on 01424~752793 for all further details. STAPLECROSS LUNCHEON CLUB: ‘Time passes when you’re having fun’ is the old adage, and this is certainly true with the local Dining Group, as it seems barely last week that we all met and enjoyed great food amongst congenial company. The members of this small but very friendly dining group will be meeting up once again to begin their Autumn cycle of this charming little local Dining Group. The next monthly meeting will be on Wednesday October 17th at 12.30pm in the Village Hall in Staplecross TN32 5QG. On the menu this week to delight us all will be that firm family favourite of Cottage Pie with all the usual trimmings, followed by another very popular choice of dessert, that of Bakewell Tart. All this, for a meagre sum of £6:00 per person, whilst being waited upon -and- with NO washing up or clearing away or tidying up chores to do at the end of the meal. Rules are few and far between. -so please do contact either Sally on:01580~830000 or Pauline on 01580~830570 to find out all you need to know about joining us in our warm and welcoming monthly dining group. We look forward to seeing you at our table. E.S.& B. Garden Society : The next Advance notice is that of the E.S.& B. Garden Society meeting, which is repeated again in order for you all to get out your cookery books -or your secret favourite recipe stash - and start looking out your best recipe - using apples- in preparation for the popular autumn meeting which will exhibit, and taste the results of these efforts ! On Thursday October 18th commencing at 7.30pn - as well as another great speaker booked to entertain us in the form of Aaron Bertelsen - gardener, cook & writer, hailing from Great Dixter - It’ll also be the time when the Apple Dessert Competition takes place. This has become extremely popular over the last few years, as everyone gets to taste and enjoy the various delicious offerings made for this event. Look up your own favourite Apple dessert, make it & bring it along, on the night---tasting spoons will be provided !. For more information on what to also look forward to, in November & December as well as what’s planned for 2019 please contact Gill: 01580~830551. We look forward to seeing you soon. NORTHIAM BONFIRE SOCIETY: Another great night in the calendar of Sussex Events. Our sister village and long time supporter of our own Bonfire Celebrations will be holding their own celebrations on Saturday October 20th. Lots of exciting amenities will be available to entice & delight us including a bar; lots of food choices and live music on the Bonfire Field. The Procession starts from the Bonfire Field at 7.30pm and ends with the Bonfire being lit an hour later - at approximately 8.30pm. For more information on this amazing and dazzling night, please check out:www.northiambonfiresociety.co.uk Do go along and have what promises to be a great night out. CHURCH SERVICES: Church services for the parish of Ewhurst will commence at St. James the Great, Ewhurst Green on Sunday October 14th. Trinity 20. at 9.30am.This service will include Holy Communion. (BCP) A ‘Harvest Praise’ service at St. Marks church, Northiam Road, Staplecross will follow directly after at 11.15 am. There will be NO SERVICE today at St. Giles church, Bodiam. If there is any church matter on which you feel you may need further assistance, especially Baptisms, Weddings and sadly, Funerals, then do please get in touch with our Priest in Charge, Canon Christopher Irvine on 01580~830925. He is always there to care and support you and will unselfishly guide you towards the solution that is right for you. ANY NEWS FOR THIS COLUMN: PLEASE CONTACT ME: Life in and around our villages and community is far from being dull or boring as we have a welter of clubs, groups, societies, sports and other activities to take part in or just to spectate and support. If you are arranging an event in the foreseeable future, --- whatever the nature of the event and however large or small, indoors or out - and you’d like some extra free coverage for it, - courtesy of the Observer Newspaper - then please get in touch. If it’s of interest to you, - it’s of interest to us. Unnervingly Christmas is just around the corner, with lot’s of exciting events being planned, so it’s never too early to send in any of the details and to tell us what you are planning - so please do contact me, as I’d love to hear from you and to help ‘spread the word’ on your behalf. ..........Thank You.